In the Greek island of Mykonos, a row of houses line up the waterfront with their balconies extending out to sea. These houses used to be the homes of the rich inhabitants of the island before they were converted into the shops, bars and restaurants that they are today. This part of the island is also known as Mikri Venetia or Little Venice due to similarities with the Italian city like its proximity to water. This area is also regarded as the most romantic as well as the most photographed part of Mykonos…aside of course from the famous windmills scattered around the island. During my visit to Mykonos a few years ago, I strolled through this part of town on my way to see the windmills but failed to pay attention to the beauty of the place. Thankfully I took the time to explore this area on my way back and was able to take the photo above. I think it was also perfect timing that the sun was about to set and the sunlight was turning a richer shade of gold. It made my photo softer, dreamier and more romantic. Greece is one of the most beautiful countries I have visited and I hope to visit it again in the future. Maybe if fate allows I’ll stay a little longer on my next visit. Aside from being known as Greece’s party island, Mykonos is also famous for its windmills which has become the iconic symbol of the island. When I visited Mykonos a few years ago, I hiked my way across town just so I can photograph these quintessential features of the island. The walk was a delightful experience passing through narrow alleys between whitewashed cubic stone homes with the wooden parts painted in playful colors. The windmills, which were once used to make flour out of wheat and barley are no longer operational today. Fortunately, the town has managed to preserve them by turning some into museums. Somebody told me that some of these windmills are actually private homes but I’m not sure if there’s some truth to it. If sunsets in Greece are always this beautiful, I am not surprised why Greeks wrote the most inspired, prolific and passionate pieces of literature ever written. Their curiosity and thirst for knowledge also resulted to contributions to science, mathematics, medicine, philosophy, law, art, mythology and theater to name a few. Greece is such a beautiful country with a rich heritage and a culture that dates thousands of years back. It is amazing that a country so small has contributed so much to humanity. Imagine my excitement when I visited Greece for the first time a few years ago. My trip took me to the capital city of Athens and the islands of Santorini and Mykonos…three of the most visited places in that country. The photo above was taken on a boat outside of Mykonos as we were sailing towards the sunset. The colors of the sky was made magnificent by the perfect combination of the golden lights from the setting sun and the thin clouds filtering it. This post pays tribute to Hesperides, the four nymphs of the evening in Greek mythology, who are also the daughters of Atlas and symbols of the golden light of the sunset. This photograph reminded me of sirens in Greek mythology known to lure poor sailors to their doom using their enchanting voices. In the case of this siren, she was too busy taking selfies for her Facebook profile thereby saving the souls of a few lonely sailors. I took this photograph in Mykonos, Greece at the section of the town referred to as Little Venice. The rich blue waters of the sea was a beautiful contrast to the white washed walls of the buildings, which were mostly restaurants with great views of the sea. I don’t know how this woman got to this rock but I’m glad she did coz she added an interesting and fun story to my photograph. I never anticipated I would enjoy cruising considering my first experience was quite an unpleasant one. However, despite my nauseating initiation into cruisedom three years ago, I eventually learned to love it and have been on five cruises so far and looking forward to my sixth in a few months. The photo above was taken on the top deck of the Celebrity Reflection during my cruise in the Mediterranean two years ago while we were tendered off the shores of Santorini, Greece. The sun was just setting behind this world renowned Greek island when the sky suddenly turned into a beautiful canvas of pink and gold splashes. 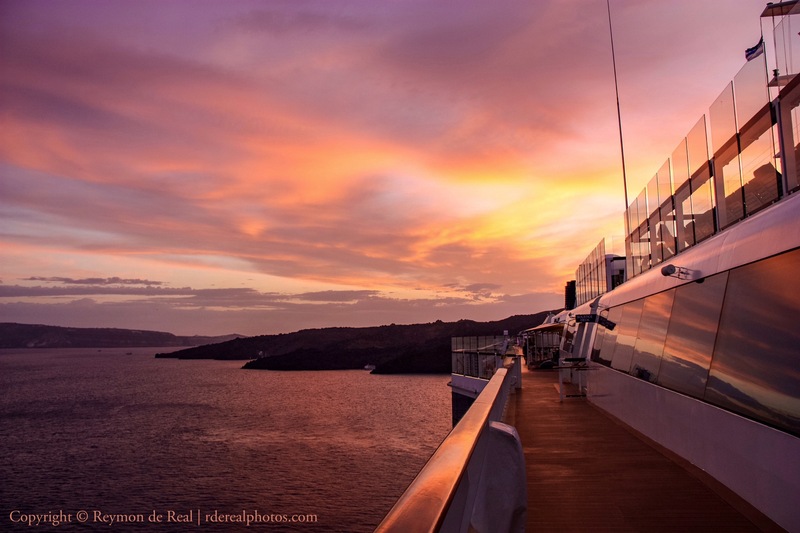 I always enjoy walking around the top deck of a ship at sunset with the hopes of witnessing a beautiful celestial phenomenon for my eyes to enjoy and for my camera to capture. 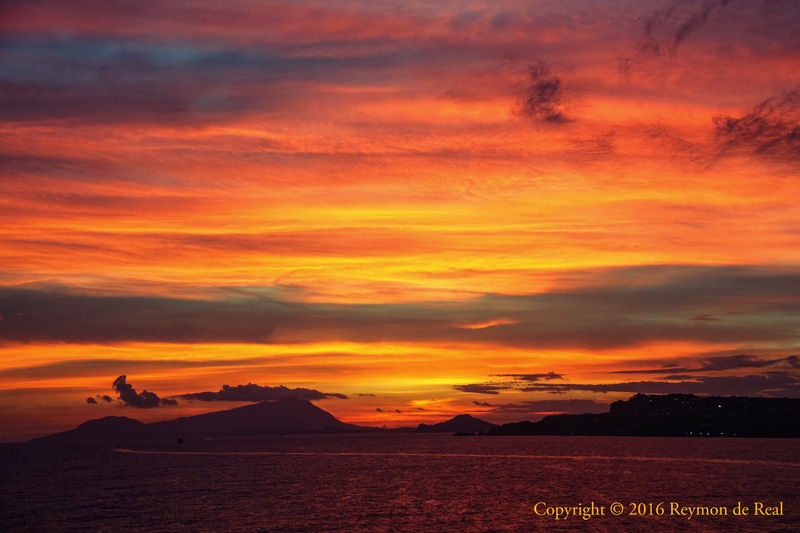 One of my favorite photography subjects is the sunset as it always bring out a multitude of rich colors creating a kaleidoscopic sky that can inspire the lover, artist, writer, poet and dreamer in each one of us…or in my case, the photographer in me. The beauty of a sunset is further magnified by the presence of cloud formations as they add depth and dimension to the multihued sky. This photograph is one of my personal favorites as this made the sky look like a painting creating a moment that was worth capturing and cherishing. I took this photo somewhere in the Mediterranean Sea while cruising around that part of the world during the fall of 2014. Rarely do I encounter sunsets as visually stunning as this so I’m glad I was there to capture that polychromatic moment. The island of Mykonos in Greece is famously referred to as the island of the winds but in Greek mythology, it is also known as the location of the great battle between Zeus and the Titans as well as the site where Hercules killed the giants after luring them out of Mount Olympus. I visited Mykonos two years ago and fell in love with this beautiful and mystical island. 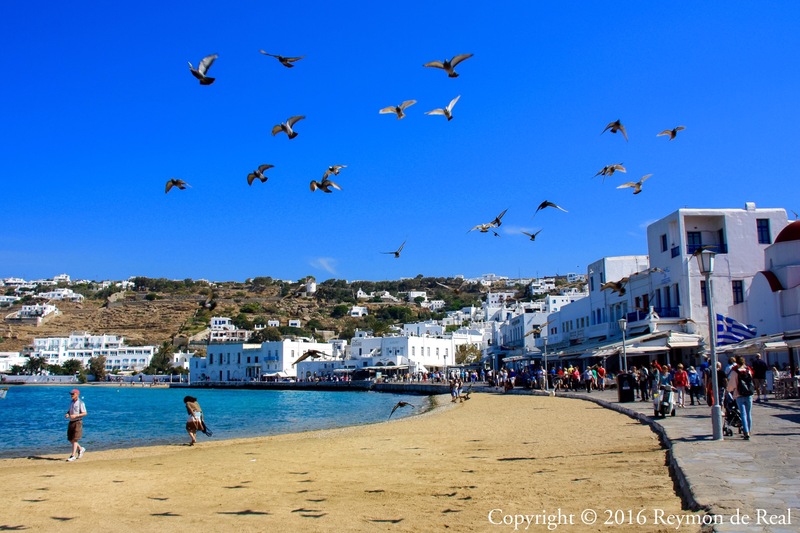 This photograph was taken at the town’s main section facing the Aegean Sea where this little boy was running around driving a flock of sea birds out into these beautiful blue skies. Luckily, I was about to snap my camera to photograph the town in this angle so the birds in flight came as an added bonus. In the Greek island of Santorini, low-lying and colorful cubical buildings cling on the side of the remnant of a volcanic caldera hundreds of feet above sea level providing an unobstructed view of the Aegean Sea. The island also boasts of its beautiful sunsets and due to the layout of the buildings, you get a front seat view of the sunset anywhere you sit. Tourism is the island’s major industry and it has been ranked as the world’s top island by travel magazines and websites. When I visited this island more than a year ago, I exhaustingly maneuvered myself for hours through narrow alleys with sharp turns and steep climbs in order to truly experience the essence of this ancient municipality. Unfortunately, my feet started killing me way before sunset so I decided to head back to my cruise ship and skipped the chance to witness one of the world’s most beautiful sunsets. I guess I now have a good reason to revisit Santorini in the near future so I can finally photograph its famous sunset. With the Star Wars film hitting theaters just a few days ago, I thought this photo would be a nice tribute to one of my favorite films as this interesting looking building reminds me of one of their sets. 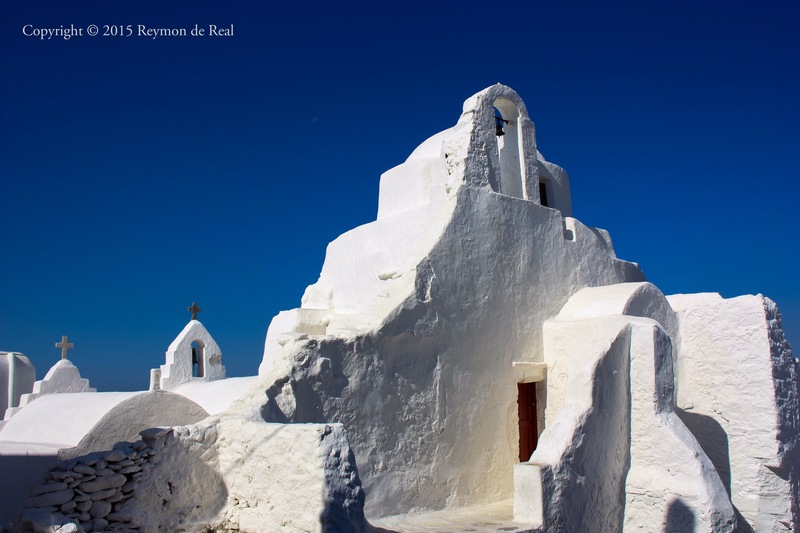 This is actually a church in the island of Mykonos (town is also called Chora) in Greece. I love the contrast between the blue sky and the white-washed walls…very Greek flag indeed! But going back to Star Wars, I can picture the robot C-3PO walking out of that door and happily blurting out “May the force be with you”! The Temple of Athena (more commonly known as the Parthenon) in Athens, Greece is one of the most photographed structures in the world. It is a symbol of Greece’s impressive and rich heritage as well as proof of an advanced and highly organized society from centuries ago. It has been my ultimate dream to visit this place so imagine my heightened emotions when I finally got the chance to stand in front of its greatness. Fortunately for me, the multitude of tourists were at that time on the other side of the ruins thereby allowing me to photograph the structures empty of people. Now it looks like I got the place to myself…or maybe, I should just claim that I got a private tour of the Parthenon. LOL! A trip to Santorini, Greece isn’t complete without witnessing the glorious sunset while sipping a glass of wine in one of the hundreds of restaurants dotting the town’s famous cliffside. Imagine my disappointment during my visit when rolling clouds shrouded the famous sunset. Although after reviewing my photos, I think the clouds may have added some drama to the scenery by diffusing the light from the setting sun creating this colorful canvas of deep blues, purple and gold. The island of Mykonos in the South Aegean Sea is dotted by these beautiful windmills locally referred to as “Kato Mili”. These windmills were built by the Venetians around the 16th century to mill flour and now serve as home to locals. My cruise around the Mediterranean stopped at Chora, Mykonos where these windmills are located. As soon as we docked I immediately jumped off the ship and found myself walking through a labyrinth of white stone houses towards the opposite end of the island. I took dozens of photos around town as well as of these windmills and this photo happens to be one of my favorite. I wish I was able to stay longer but cruises usually dock for 10-12 hours before heading off to the next destination. Hopefully, time will give me another chance to visit and when that happens I’d definitely stay for a few days to enjoy this beautiful island. A sunset is one of my favorite photography subjects because the sky showcases its best and richest colors. 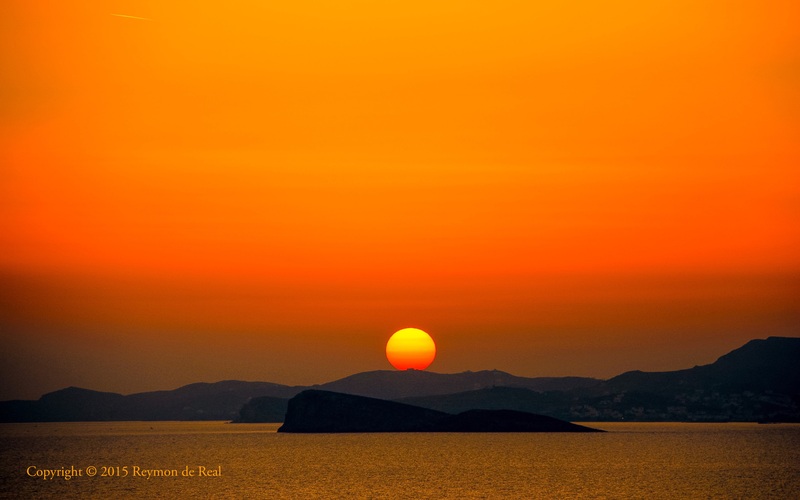 In this photo, the sky is illuminated with a spectrum of red and gold creating a rich canvas for the setting sun as well as the dark shadows of this cluster of Greek islands. This photograph was taken in the Aegean Sea, aboard the Celebrity Reflection, a few nautical miles from the island of Mykonos where we were docked earlier that day. The ship was already far out at sea so I had to zoom in my lens to capture the sun and the islands in this perspective. 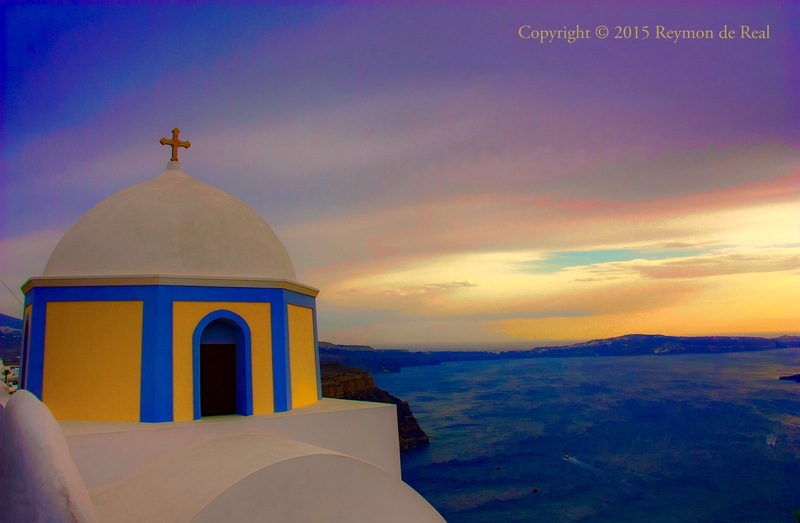 Thira, popularly known as Santorini, is a Greek island located in the southern Aegean Sea. It was the first stop of my Eastern Mediterranean cruise and I was looking forward to taking gazillions of photos of this famous island. Imagine my disappointment when we arrived on a cloudy day with rainshowers about every hour. Everything looked dull and gray with my photos coming out stark and somber. Later in the evening, after a sumptuous Greek dinner, I decided to go up the topmost deck of the ship and noticed that the sky has cleared. 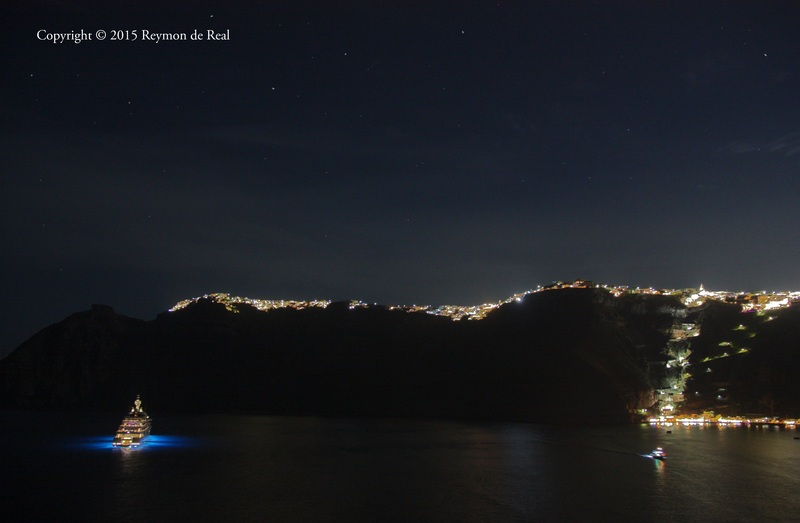 The city lights sparkled in the distance highlighting the rim of this volcanic island while this behemoth of a yacht created an interesting juxtaposition to the island. I took about a dozen photos and this came out to be my favorite. Gladly, I also captured a few stars tossed all over the thinly clouded evening sky. 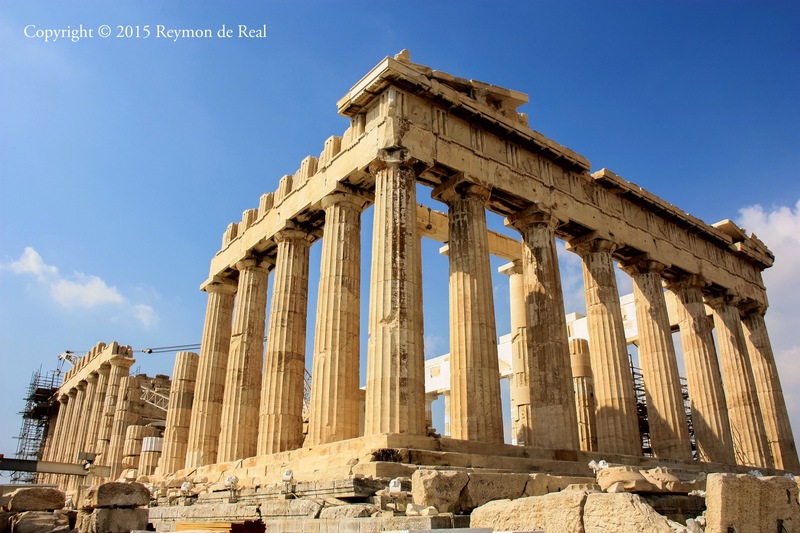 This photo was taken at the historic Acropolis complex in Athens, Greece. Our tour guide gave us a few minutes to explore the area when I noticed this lonesome tree (olive tree?) perched right by the edge of the cliff. 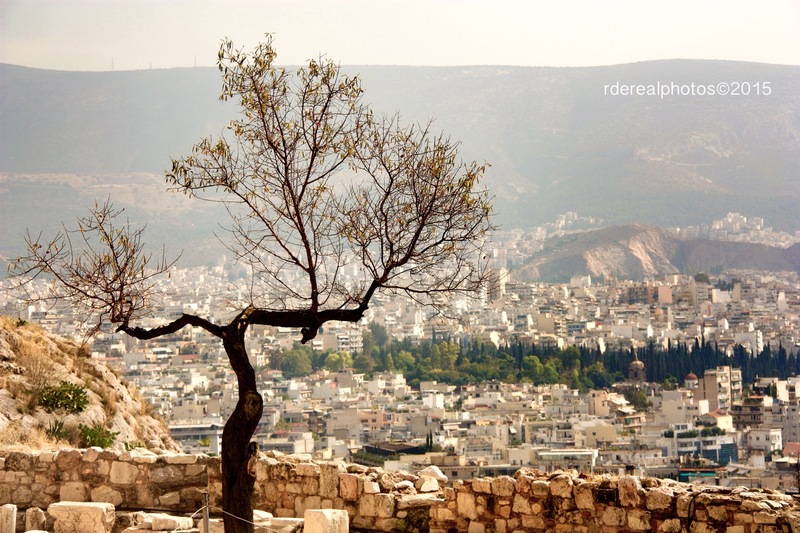 It’s branches were spread out as if waving hello to the ancient city of Athens below.